More than half of London's LGBTQ+ spaces have closed since 2006, but a version of the Joiners Arms will now stay open for 25 years. One of east London’s most famous gay bars has won the right to stay open for another 25 years, following a three year campaign. The Joiners Arms was threatened with closure — a fate that has befallen many of the city’s most popular LGBTQ+ spaces in recent years — when property developers bought the site in 2014. The iconic pub in Shoreditch — which, among many other things, was one of the first in the country to pay all its staff a living wage — was set to be demolished and turned into luxury flats. 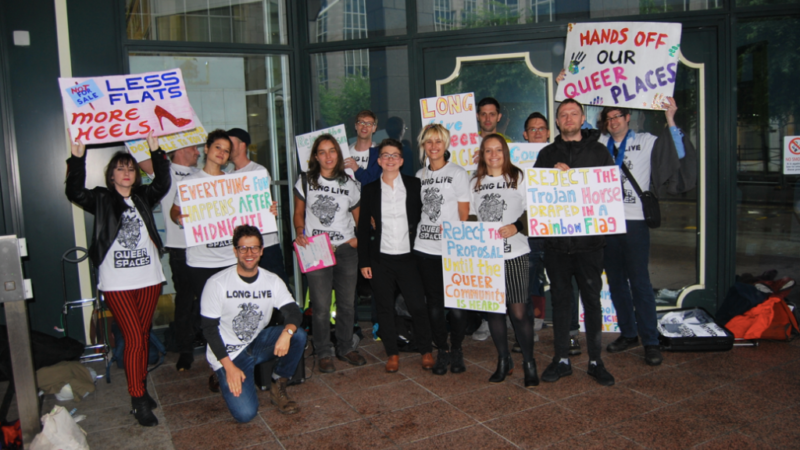 But a campaign group, Friends of the Joiners Arms, sprang up to oppose the closure, putting pressure on Tower Hamlets council to stipulate the developer, Regal Homes, must factor an LGBTQ+ community space into their plans. The group successfully secured ‘Asset of Community Value’ status for the venue, which gave the community a greater say in the pubs fate. An initial offer from Regal Homes of an unfurnished venue without a late license or smoking area— to minimise disruption to residents of the planned flats — was rejected by the group who said it was not viable, describing the offer as a ‘Trojan horse draped in a rainbow flag’. Yesterday the council finally said developers must factor a late-license LGBTQ+ venue into their plans, and grant the space a 25 year lease. They must also ‘maintain a local link to elected representatives, and to the LGBTQ+ community’ in selecting an operator for the venue. Friends of the Joiners Arms have declared this a major victory, in a city where 58 percent of gay venues closed between 2006 and 2016, almost all as the result of rapid gentrification. “This is an important victory for the LGBTQ+ community, not just in Tower Hamlets, but across the whole of London. “What today shows is that dedicated citizens – sharing a common purpose – are powerful and can win big, against overwhelming odds. Campaigners now hope to transform the Joiners Arms into London’s only cooperatively owned and managed LGBTQ+ Community Centre, while maintaining its functions as a pub with late license. The group said it envisages “a space that provides vital facilities and support to all LGBTQ+ individuals and allies who wish to stand up for minority communities, support one another, and proactively engage in building a future free of hate and insecurity”. Charlotte England is a freelance journalist and writer at Left Foot Forward. Follow her on Twitter.